A lot of people have asked me about how to go about increasing their reps on pull-ups. There are a lot of ways one can successfully do this, but the method that I am proposing is probably the most simple and direct. 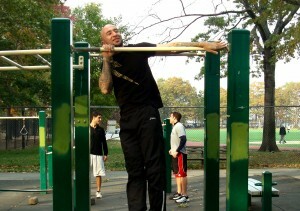 The 50 pull-up challenge consists of doing 50 pull-ups in one workout, no matter how many sets it takes you. Even if it means you are doing sets of one rep by the end. You are allowed as long of a break in between sets as you need. For example, you might start out with a set of 10, followed by a set of 8, followed by a set of 7, then 2 more sets of 5, 3 sets of 3, 2 sets of 2, and end with a couple sets of 1. This could take a while at first, but over time the amount of sets that you can do this in should go down. At first I would recommend only doing this once or twice a week, as it will be a bit of a shock to your body. Eventually, however, you can condition yourself to doing this just about every day. After a month or two, you could have it down to 4 or 5 sets. Highly fit individuals can do this in one or two sets. After a while it could simply be your warm up! This same approach can be used to increase reps on pretty much any other exercise as well, like push-ups, dips, or even pistol squats. Additionally, if 50 is just not realistic for you right now, then pick a smaller number (maybe 30?) and then build up from there. For women it might be better to do the challenge with modified pull-ups. The 50 Pull-up Challenge is not for beginners or the faint of heart! If you are not ready for it yet, doing the challenge with pushups instead of pull-ups is a more modest task to approach first. I met Kartik back in the summer of 2005. He approached me during my workout while I was in between sets of deadlifts. I remember he seemed amazed that I was doing deadlifts after just finishing up three sets of squats. Soon after that initial meeting he started training with me and he has stuck with it ever since, longer than any of my other clients. Now he’s done squats and deadlifts back to back himself on many occasions. 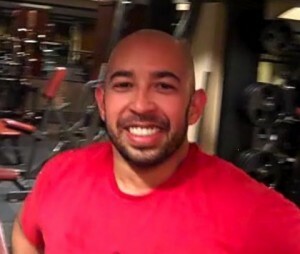 When I first began working out with Kartik, he had recently gotten over a shoulder injury and was worried about doing things like pull-ups and dips. But over time his shoulder has gotten so much stronger and more stable. Now Kartik can do 15 consecutive wide grip pull-ups and 20 consecutive dips! Everyone asks me about training for one arm pull-ups (or chin-ups, or whatever you want to call them). They come in many varieties but I tend to put them all under the general umbrella of pull-ups. I’ve never really been a stickler for that sort of thing. The video segment below shows you three different techniques that you can practice to work up to one arm pull-ups: one arm negatives, archer pull-ups, and one arm pull downs (on a cable machine). Keep in mind that these are not the only ways to train towards one arm pull-ups. There are many paths that lead to the same destination–be creative! Also, be prepared that the first time you try to do the one arm negative you will drop very quickly. When starting out, don’t think of it as a negative, think of it as just trying to keep yourself up. Gravity takes care of the rest. Archer pull-ups are a great exercise regardless of if you want to work towards a one arm pull-up or not. When performing the archer pull-up as practice for the one arm pull-up, try to do as much of the work as possible with the arm closer to you. Think of your extended arm simply as a means of giving yourself assistance. Use it as little as possible. Eventually you won’t need it at all. Check out part two of my series on working towards one arm pull-ups, featuring the one arm Australian pull-up. The first time that I ever saw someone do a one arm pull-up was in Tompkins Square Park in 2007. I was absolutely in awe and I knew I had a new challenge ahead of me. It was a very exciting time! The one arm pull-up is a fickle mistress. It’s an elusive enigma that reminds me to stay humble and keep taking my vitamins. Some days it comes a bit harder than others. The one arm pull-up attempt in the video below is decent but still leaves room for improvement. With practice, I hope to eventually get my chin several inches above the bar. I’m also working towards starting from a dead hang. Gotta keep practicing!!! Check out my article on how to train for a one arm pull-up! Note: This is an old post. Make sure to check out my updated post on Australian pull-ups. The pull-up is one of the all time greatest exercises that mankind has discovered. Just like the other classics, the pull-up can be modified in an infinite amount of ways. One of my favorite variations is what’s often referred to as an Australian pull-up. This variation involves hanging below a bar that is set just above waist height while keeping your heels in contact with the ground. You’ll wind up at an angle that’s closer to horizontal than vertical. 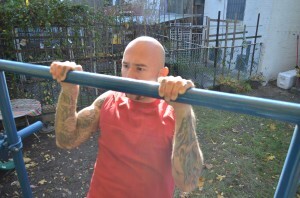 The Australian pull-up is a great way to work up to doing a regular pull-up if you aren’t strong enough to do one yet. Even if you are strong enough to do lots of pull-ups, the Australian pull-up is still worth putting into your routine. It puts a little more emphasis on the rear delts and the muscles of your middle-back; muscles that may not be getting completely and thoroughly worked with regular pull-ups alone. For those of you who are more advanced, try doing them as a superset right after a set of regular pull-ups. This is a great way to work towards adding more reps to your pull-up total! 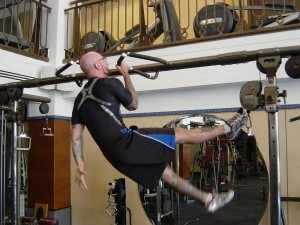 The Australian pull-up can be done on a Smith machine (as pictured) or any bar that is about waist height as long as it is securely in place. The Smith machine is great for this exercise because it is adjustable (the higher the bar the easier it will be–so start high if you’re first learning) and secure. You can get creative with finding cool places to practice these and all types of pull-ups, just stay mindful of your safety. Click the link to read about the ONE ARM Australian Pull-up!